Hey everyone!! So over the past couple of days I have been shopping, mainly in the drugstore to look for some new skincare bits and bobs and I've come out with quite a lot of products as you can see from the photos above. I went in for a couple of skincare bits and bobs and ended up spending nearly £70. Oops!! Anyway this got me thinking that actually I haven't done a beauty haul on my blog in quite a long time. I love reading haul posts as it always introduces me to new and different products I wouldn't have known about otherwise. Most of the beauty bloggers I follow are always purchasing higher end brands which I love but unfortunately cannot afford. 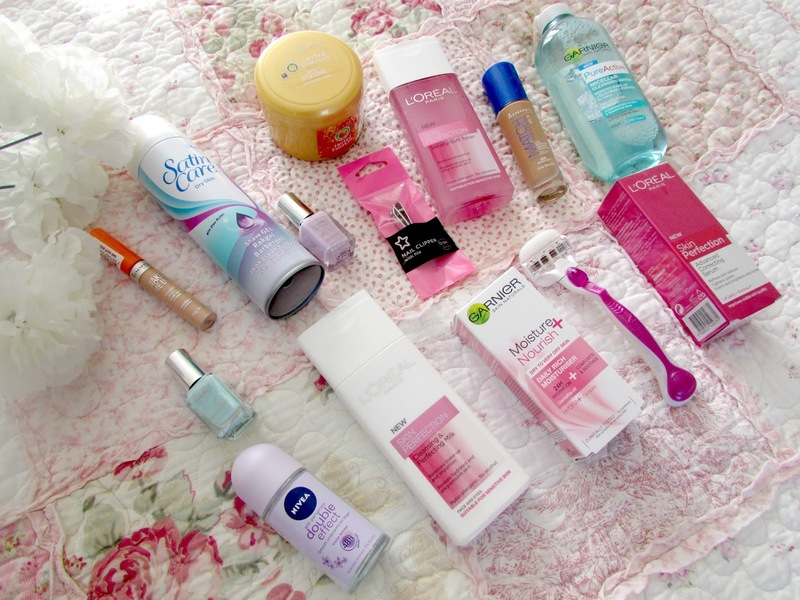 I know a lot of you that read my blog are at that age where you are still studying and perhaps can't afford the more expensive brands so hopefully this post will help you discover some drugstore products that you are in need off. Hope you enjoy this post. Make-up is actually something that I haven't really spent a lot of money on recently. I have just been using up all the products that I already have (look out for an empties post coming up soon) but I was in Superdrug and just couldn't resist. I picked up two foundations. 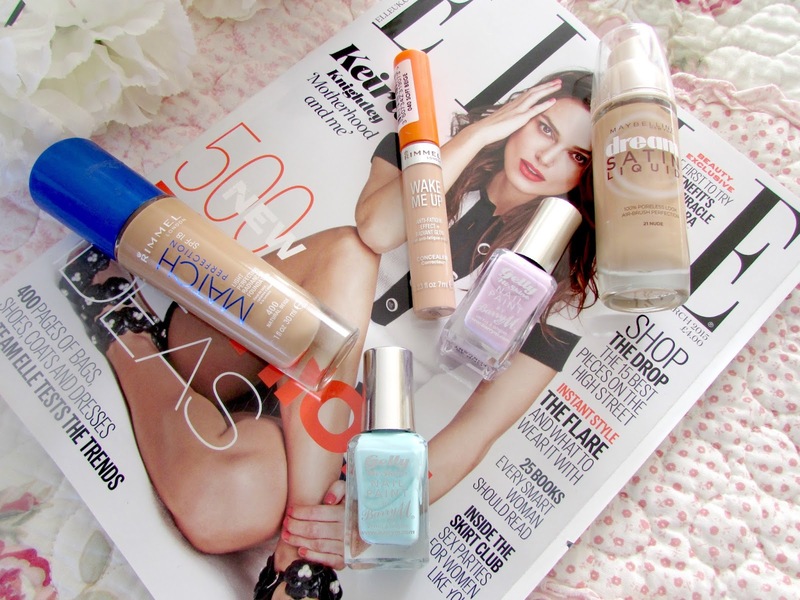 The first one is Maybelline's Dream Satin Liquid foundation which I actually bought a couple of weeks ago. I've been using it almost everyday since and I absolutely love it. Such gorgeous coverage and it really does make my skin look practically airbrushed which I love. I then took to twitter to ask what a good dupe is for Nars Sheer Glow during a bloggers chat and A LOT of people said that Rimmel's Match Perfection is an excellent dupe. I am currently wearing it whilst writing this post and I am very impressed. I then decided to purchase the Rimmel Wake Me Up concealer and give it another ago as I tried it when I first started blogging and I just wasn't keen and really did not understand the hype. I've seen a lot of youtubers and bloggers speak about it recently which is why it came to my attention again. I've used it once since purchasing it and I'm already questionning why I didn't like it! With Spring around the corner I decided to purchase a few pastel nail polishes from Barry M. If you've been reading my blog for a while then you will know how much I absolutely love the hi-shine range. I decided to purchase a beautiful pastel green shade called Sugar Apple which I've spoken on my blog around this time last year and another beautiful purple-pink shade called Fondant. I can't wait to wear them as they are stunning. 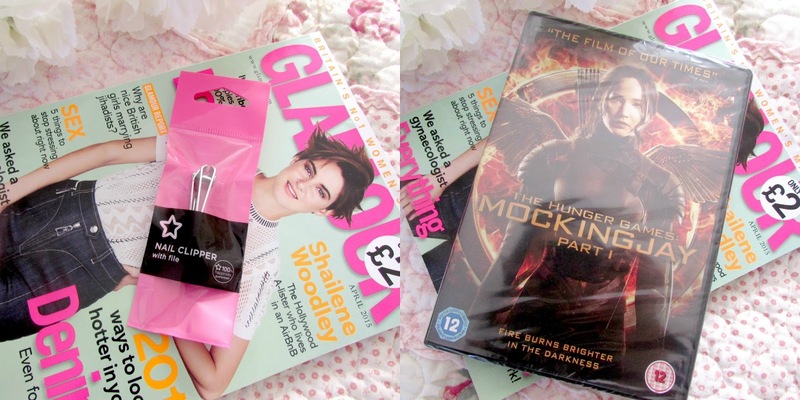 Now for the real reason why I went into Superdrug. Skincare. I haven't got a normal skincare routine at all at the moment ever since my Liz Earle Cleanse and Polish finished and it's definitely something I'm looking into. 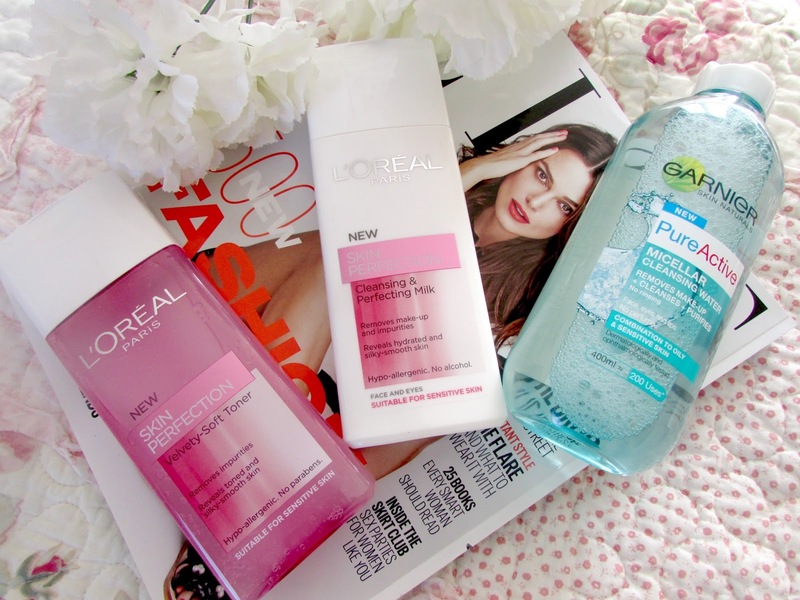 I spotted the Loreal Skin Perfection Cleansing Perfecting Milk and the Skin Perfection Toner so I decided to purchase them. 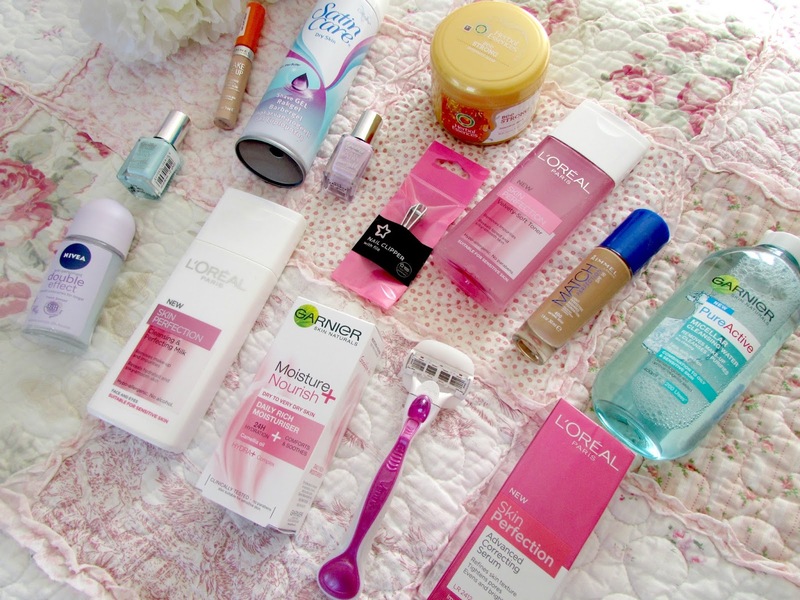 I absolutely love the L'Oreal Miceller Water so I do have high expections. If you've been reading my blog for a while then you will know how much I love the Garnier Miceller Water which is the perfect drugstore dupe for Bioderma. However when I went to purchase it again the other day I noticed a new bottle beside it. Garnier Pure Micellar Water. As the product is blue it is easy to tell the two apart. This micellar water is aimed at combination to oily & sensitive skin. I'm definitely looking forward to trying this out. Look out for a compare and contrast post in the future. I then decided to head on over and purchase a couple of moisturisers. 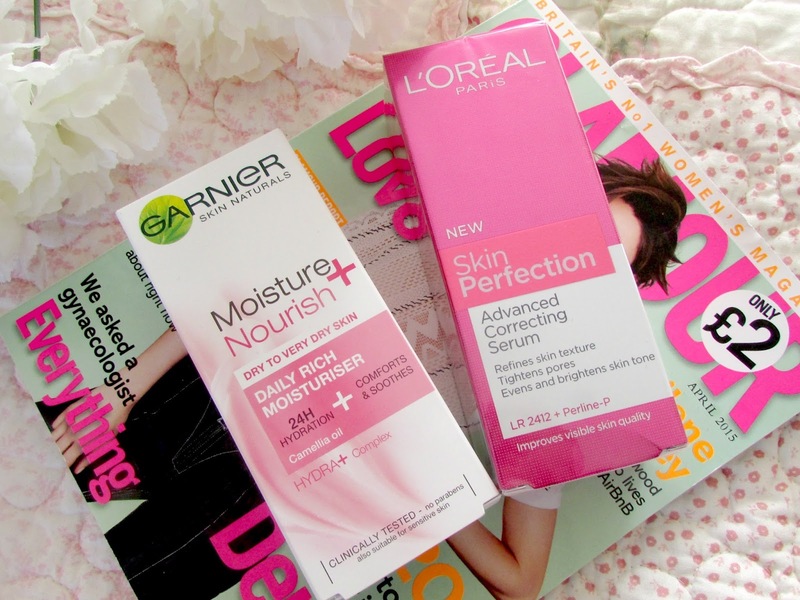 I absolutely love the Garnier Moisture and Nourish moisturiser as they are extremely good products and just so super affordable. I think this was under £2. My skin has become extremely dry recently so I was definitely on the look out for something that can help this. I absolutely love the L'Oreal Paris Skin Perfection range and I've had my eye on the Advanced Correcting Serum for a while so I didn't hesitate to pick it up when I spotted it. My skin isn't in the best condition so I'm hoping this helps it to improve. You probably don't need to know how I remove the hairs on my legs but I thought I'd share that little fact with you anyway as leg shaving season is fast appraching. (Don't worry I do shave my legs all the time) I was watching the gorgeous Carly Musleh's video on the do's and donts of shaving legs (Check that out HERE) and I really liked the sound of the razor she mentioned so I decided to purchase it. The razor was the Venus 5 Blade Sugarberry razor. It smells absolutely incredible. I haven't yet used it but I'm excited to try it. I also purchased the Satin Care shaving gel for dry skin. 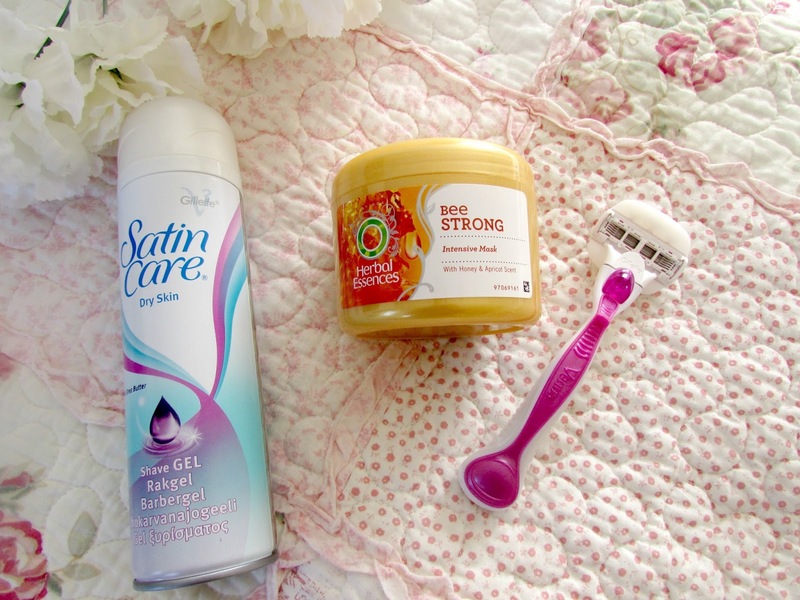 I absolutely love the satin care range so I'm extremely excited to try this combination. I also decided to purchase an intensive mask for my hair and opted for the Herbal Essences Bee Strong. This product smells absolutely incredible and Nicole Scherzinger uses it. I really didn't need any more persuasion to purchase it. I'm lucky enough to have fairly healthy hair anyway but there's no harm in giving it that added TLC at least once a week. I can't wait to use this. A couple of random things I decided to pick up was a nail clipper which is fairly self explanatory and a deodrant from Nivea which I forgot to photograph seperately but it can be seen in the first couple of images and that's obviously self explanatory anyway. I prefer using roll ons to the ones that you spray under your arms as the spray ones have ended up giving me lumps. The Hunger Games Mockingjay Part 1. When I went to see this in the cinema it was full of kids running around the cinema, shouting and swearing at the screen that I unfortunately can't remember much of the film as I was just so angry so I'm excited to have a little movie night in with this. I think Jennifer Lawrence is an absolutely incredible actress too so I can't wait. 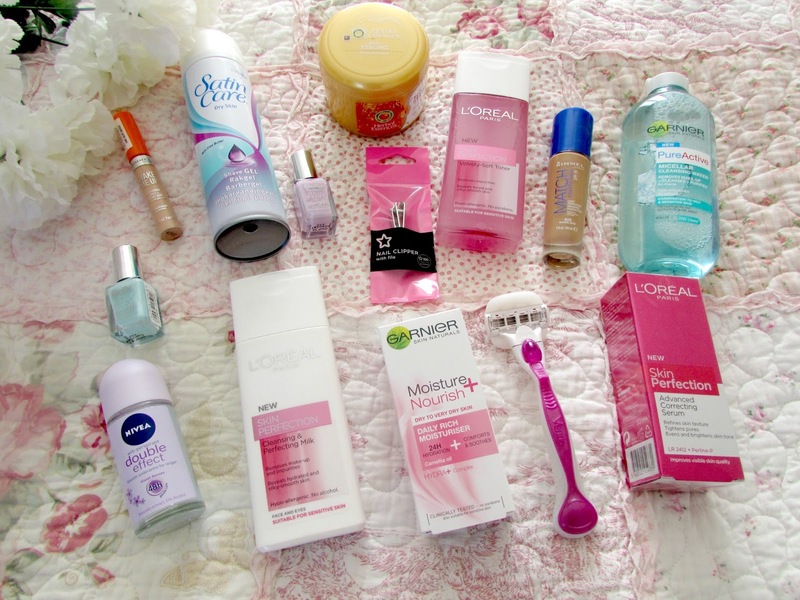 So these are all the beauty and random bits and bobs I have purchased recently. I really want to start getting back into beauty blogging as my blog has mainly been lifestyle for quite some time but as you can see from the list here there really is no excuse for that any more. If you've tried any of these products before be sure to let me know what you thought in the comments section below. If you've done reviews then be sure to link them below as well as I'd love to have a read. What beauty bits and bobs have you bought recently? I've recently done a first impressions post about the L'oreal Skin perfection range too :) in really loving them, and think it has been a great investment so far too!